The National Electrical Code (NEC) applies to the construction of PV systems installed on buildings. The 2014 version of the NEC includes a requirement for rapid shutdown of controlled conductors outside the PV array boundary. The proposed 2017 NEC modified that rule to effectively require shutdown at the module level, which could have a dramatic impact on how systems are designed and installed moving forward. The sensor unit: it is integrated into PV module, and has the functions of monitoring and rapid shutdown. The gateway: it transfers information with sensor units. It receives rapid shutdown signals from the RSD sources. The RSD sources: the devices that generate the rapid shutdown signals, could be inverters or RSD safe buttons. The sensor units continuously and periodically get "allow-to-work" messages from the gateway. 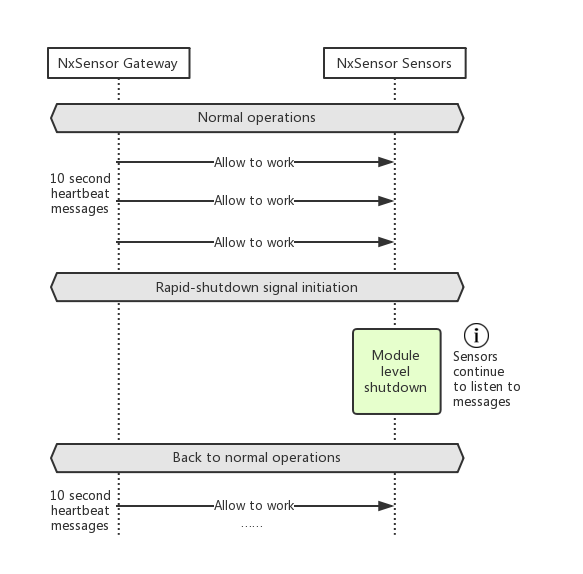 When rapid shutdown is triggered, the gateway receives RSD signal from the inverters or RSD buttons, this could be achieved by either data buses or simple on/off signals. After that, the gateway stops sending "allow-to-work" messages. If the sensor unit doesn't get "allow-to-work" messages within 10 seconds, it would cut off the associated PV module's power output. Since the sensor unit is powered by the PV module, it is still able to continue to listen to the "allow-to-work" messages during the shutdown stage, this is for the purpose of recovering the PV module's power output later. Because the sensor units and the gateway are communicated by wireless method, the PV module's power could be completely shut down. In comparison with the PLC (Power-line communication) based rapid shutdown solutions, they would need a low voltage output on the PV module, keeping the sensor unit's communication availability, in order to avoid the system deadlock. Copyright © 2018 NxSensor Technology. All Rights Reserved.